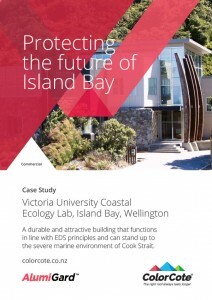 A durable and attractive building that functions in line with EDS principles and can stand up to the severe marine environment of Cook Strait. Wellington’s iconic Island Bay is usually associated with surfing, but it’s also a place to learn about marine life. Victoria University established a Coastal Ecology Laboratory on its northern shores in a collection of old industrial buildings, once used as a fish cannery. But when these old buildings became too run-down, cramped and uneconomic to maintain, they were replaced by a new facility. “Designing a new building for such a prominent waterfront site was no easy task, from both durability and aesthetic points of view. The south coast is an iconic environment in Wellington, with stunning landforms and sea views – on rough days, however, the site is blasted by salt-laden southerlies,” says Tim Burns of Pynenburg and Collins Architects. The brief called for a durable and attractive building that functioned in line with Environmentally Sustainable Design principles. Natural materials – stone, metal, glass and the large curved timber ribs at the entrance – were used in different zones to help ensure a coastal feel in appearance. Pre-painted corrugated metal was used on the roof, feature walls and over the entrance, but traditional galvanised iron is just not suited to such harsh environments, so a modern substrate was specified for the laboratory building – ColorCote AlumiGard pre-painted aluminium roofing and cladding. ColorCote AlumiGard is constructed from type 5052/5005 marine grade aluminium alloy substrate, it is protected by a primer and PVDF top coats that deliver a highly durable finish that can withstand the extreme marine environment of this part of the Wellington coast. © Copyright 2019 Pacific Coilcoaters, a subsidiary of Fletcher Steel Ltd. All Rights Reserved. ® ColorCote is a registered trademark of Fletcher Steel Ltd. ™ AlumiGard, MagnaFlow and ZinaCore are trademarks of Fletcher Steel Ltd.